Lee Jae-yong, vice chairman of Samsung, entered the Seoul High Court last month to stand trial on charges of bribery. 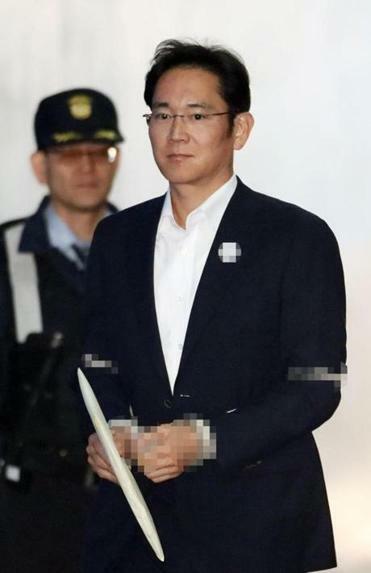 SEOUL — South Korean prosecutors on Wednesday demanded a 12-year prison term for Samsung’s jailed billionaire heir, Lee Jae-yong, who maintained his innocence during an appeal of his conviction on bribery and other charges. In August, a lower court sentenced Lee to five years in prison for offering bribes to former South Korean president Park Geun-hye and her confidante while Park was in office. Both Lee and prosecutors, who earlier had requested a 12-year prison term, appealed that ruling. Prosecutors said Wednesday during Lee’s appeal hearing that they still want Lee to receive 12 years in prison, according to the Seoul High Court. South Korea’s Yonhap News Agency cited the court as saying it will issue a ruling on Lee on Feb. 5, but calls to the court went unanswered. If the court’s ruling is appealed again either by Lee or prosecutors, his case will be handed over to the Supreme Court, which will make a final ruling on him. Lee’s bribery case is part of a huge political scandal that led to the ouster of Park in late March after millions of South Koreans took to streets for antigovernment rallies for months. Park and her friend, Choi Soon-sil, were arrested and charged with taking bribes from Samsung in return for helping Lee cement his control of the company for a smooth transfer of power. Prosecutors have also charged both Park and Choi with pressuring Samsung and other big businesses to donate a total of 77.4 billion won ($68 million) for the launch of two nonprofit foundations controlled by Choi. Samsung, founded by Lee’s grandfather, is one of the key family-run South Korean conglomerates that have dominated the country’s economy. Some credit them with leading South Korea’s export-driven economy and rebuilding its economy from the ashes of the 1950-53 Korean War, but others say their successes were only possible because of corrupt, collusive ties with government officials. ‘‘It was a typical case showing cozy, collusive ties between government and businesses,’’ special prosecutor Park Young-soo said during Wednesday’s court session, according to South Korean media. Lee, who was convicted of embezzlement, hiding assets overseas, and perjury, repeated a denial of the charges, according to Samsung Group. Lee, whose official title is vice chairman of Samsung Electronics, took a higher-profile role after his father and Samsung chairman Lee Kun-hee suffered a heart attack in 2014. Samsung is the world’s largest maker of smartphones, television sets, and microchips.